Scientists calculate the surprising fuel costs of catering, carry-ons, computers, and even a full bladder. While airlines may set the fares and fees for air travel, the decisions made by passengers also come with costs. Every item on board makes a plane heavier, which burns more fuel. An airliner’s cost of operating rises with every laptop (33 cents per flight), pillow (6 cents), or magazine (5 cents) you bring along. Want your flight to burn less fuel? Start by emptying your bladder before boarding. MIT aeronautical engineers Luke Jensen and Brian Yutko used a set of typical U.S. and European flight conditions to analyze how specific items add up on three major carriers (United, American, and Ryanair) over a normal day. Uncertainties abound, such as the price of fuel or the cost of an unexpected detour. by United, even small things add up to big costs. Boeing 737 flies about 4,300 miles. maximize the number­ of passengers. Cost calculations were made using Boeing 737-800 aircraft carrying 75 percent of payload capacity. Passenger miles per gallon is derived from a plane’s average miles per gallon multiplied by the typical number of passengers. Boeing 737-800 operated by United, even small things add up to big costs. on one plane over one year. 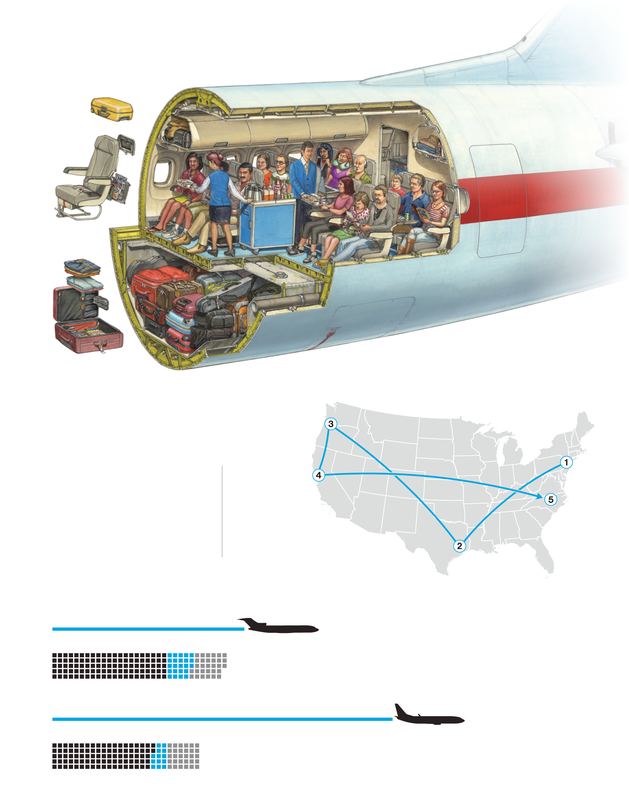 To make an aircraft cost-effective, airlines need to constantly move people or things. In one day a typical Boeing 737 flies about 4,300 miles. Compared to 40 years ago, today’s single-aisle jets can carry the same size load the same distance on roughly half the fuel. Lighter hulls, more fuel-efficient engines, and improved aerodynamics allow airlines to maximize the number­ of passengers. Cost calculations were made using Boeing 737-800 aircraft carrying 75 percent of payload capacity. Passenger miles per gallon is derived from a plane’s average miles per gallon multiplied by the typical number of passengers. typical Boeing 737 flies about 4,300 miles. And even if passengers help reduce weight, airlines don’t always share savings with ticket buyers. 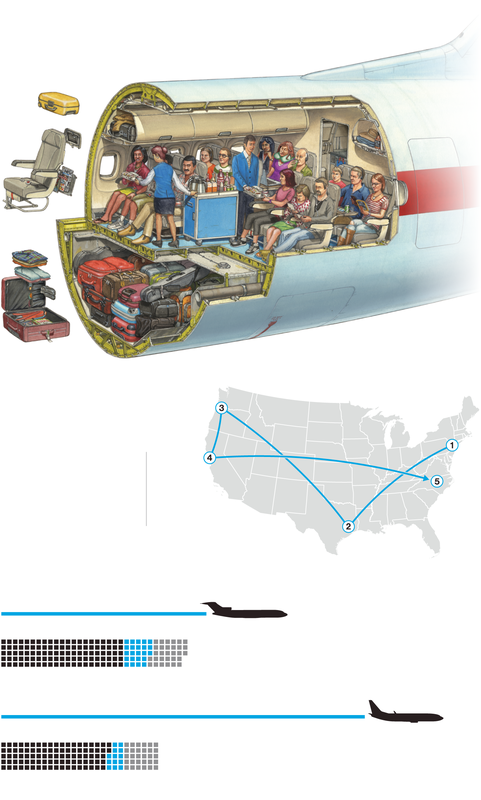 But the surest way to minimize the cost of flying a plane, says Jensen, is to limit the number of things—like bags—that people can bring aboard without an extra fee. Check out the other ways flight is being reshaped for greater fuel efficiency, through new designs, operational changes, and even airport architecture.